My musical background began when I received John Lennon's Imagine and Simon and Garfunkels's Bridge Over Troubled Water LPs for Christmas one year. I quickly became a record and radio freak. I remember spending lots of time after school bouncing on my parents bed listening to Top 40 radio. In second grade I was selected to play the snare drum in our production of The Little Drummer Boy, mainly because I was the only kid in class who could keep a beat! I also played drums in the school band in junior high. We had an upright piano for a short while and I'd tinker, figuring out songs from the radio. Ultimately, a friend who played guitar invited me over to hear him play the end solo to Free Bird note for note. I was hooked! Bought my first electric guitar at 15 for 5 bucks, and never looked back. That same friend turned me onto a classical guitarist who was giving lessons in New Haven, CT. I became a student, which is how I learned to read music. It really helped my electric guitar playing as well! 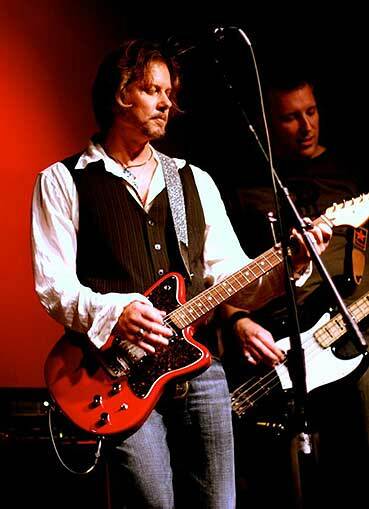 After high school I went to GIT in Hollywood, CA with visions of becoming a session guitarist. Our new CD is called Galaxyland. 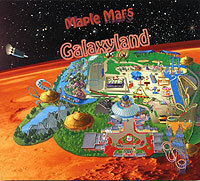 The concept came from looking at amusement park maps online and "stealing/borrowing" rides to make up my own space park! I did all the artwork for the disc, building this amusement park using rides from all over the world. 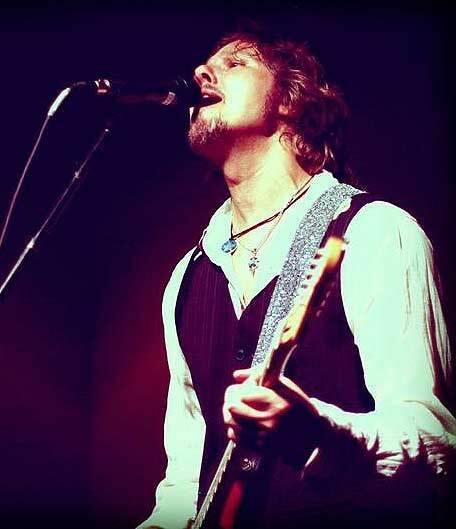 The album was recorded and mixed at Maple Mars guitarist Steve Bern's studio The Fitting Room, and at my own home studio. We used a variety of friends on the record, including the great songwriter Mark Radice, who's song "New Day" was recorded for this album. Mark also co-produced the track and plays piano. We used Nelson Bragg from Brian Wilson's band, Marty Ross from the New Monkees and The Wigs, Phil Rosenthal from Twenty Cent Crush, and singer Kirsten Proffit. Session orchestral players were hired for strings on "New Day", "When Bridges Fall", and "Head Turner". Steve Berns plays much of the lead of guitars and some rhythm, Ron Pak plays drums and sings backgrounds. I played acoustic and electric guitar, choral sitar, bass, piano and keys, chromo harp, pots and pans, and some other weird noise makers that escape me right now. The album was recorded using the DAW programs Logic and Sonar. Steve's got a nice Soundcraft Ghost console, so everything recorded at his place ran through that as well as some really good outboard gear. Much of the material tracked and mixed at my place was all done "in the box" using Logic. Steve Berns co-produced with me songs recorded at his place. I think the album reflects previous Maple Mars albums, but with a bit more experimentation. Song's like Transcendental Guidance, The Excursion, New Day, and When Bridges Fall are a bit different then the usual Maple Mars fare. All Steves guitars have Thomastik strings. He feels that while they cost a bit more, they retain their resonance and brightness longer and dont break as often. Various Universal Audio (UAD2) plug ins including the Vintage Roland Space Echo. My main musical influence has always been The Beatles. They were perfection! I'm influenced by many genres: 60's garage/psychedelic/pop, 70's glam rock/pop, 70's prog/pop, 80's pop/punk, the list goes on! My favorite guitarist of all time is Jeff Beck! From his days in The Yardbirds through his Blow By Blow days I was transfixed. I also love Hendrix, Page, Clapton, Howe, and Duane Allman. We're releasing a new original Christmas Song called "Christmastime In The City" on an upcoming compilation album called Kool Kat Khristmas from Kool Kat Musik. The song will also be for sale as a single on iTunes. I've always loved many of my song writing heroes original Christmas songs, i.e. John Lennon, Paul McCartney, Greg Lake. Even Chrissy Hynde wrote a super catchy one! So, I finally got my chance. We're planning a tour of Europe in the late spring. We've only been to the U.K. in the past, so it'll be nice to play in some new places.